When it comes to every day living, unfortunately, our kids are frequently exposed to toxic chemicals. From the food they eat to common household items, toxins abound. Below, you’ll find some of the most common toxic chemicals + tips on how to avoid them. You may recall the campaign against child abuse that said “It shouldn’t hurt to be a child.” I think the slogan applies to more than just child abuse. Our kids are being exposed to an alarming amount of toxic chemicals every single day, and it’s clear they are paying the price with their health. Ask yourself this: when you were a kid, how many friends did you have with asthma? How about autism? Cancer? Now think of your child’s peers. Those numbers probably look a lot different, unfortunately. Asthma and allergies are commonplace, 1 in less than 50 kids are diagnosed with autism, and childhood cancer rates are steadily increasing. So why are our kids so sick? I have my theories, but let’s just look at one piece of the puzzle: the overwhelmingly toxic world our kids live in. The good news is you can do something about it and protect your child by making small changes in your own home. 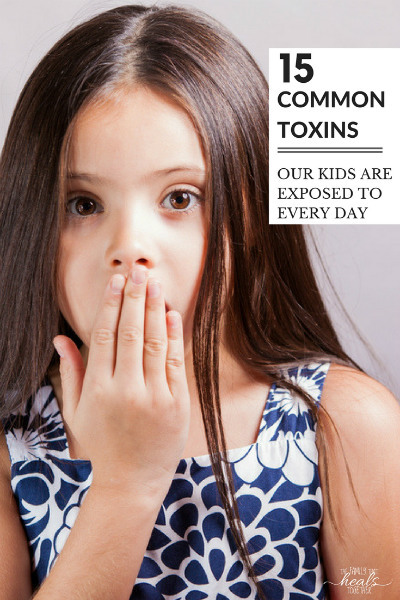 Let’s look at some common toxic chemicals our kids are exposed to every day. 1. The mattress they sleep on. Did you know that the big, soft platform your child snuggles up to each night could be a source of huge toxicity? Mattresses, like car seats and furniture, are required by law to pass flame resistance tests. Manufacturers typically accomplish this by dousing the mattresses in flame retardant chemicals, which are effective for reducing flammability, but pose huge health hazards to consumers. Unlike other products that you use for short periods of time, we sleep on mattresses for a third of our life! Mattresses also off-gas from the materials they are made from, which may include industrial rubbers and petroleum products, adhesives, and unnatural fabrics. What you can do: Look for a non-toxic mattress for your little one to lay his down on at night. My Green Mattress not only makes a mean natural mattress, but the mattresses are actually affordable. You’ll find mattresses made from organic cotton, wool, and natural latex. Best of all, their manufacturing process and materials make the mattresses naturally flame-resistant, which means no toxic, off-gassing chemicals! Shop My Green Mattress here. Not ready to make the investment? Mattress protectors made from polyethylene (a food-grade plastic) may keep those toxic chemicals under wraps. Oh down-y soft freshness, how I love/hate thee. Laundry chemicals may smell nice, but they’re not as nice as they seem. That’s because they’re the largest source of indoor air pollution. The toxic chemicals that make your clothes smell so nice are wreaking havoc on your child’s endocrine system, contributing to everything from cancer, to asthma, and even fertility problems later in life. What you can do: opt for non-toxic laundry detergents. You can find my favorite, inexpensive detergent here, try making your own, or try soap nuts. Soaps, whether the bar variety, the gel variety, or shampoo, typically contain hormone-disrupting chemicals like phthalates (often found in fake fragrance ingredients), sulfates, and parabens. These toxic chemicals can lead to mood swings, cause early or abnormal puberty, and just might cost you future grandchildren, as they can even disturb your child’s fertility. What you can do: use natural soaps for your little ones. Read labels and avoid those with preservative and unnatural fragrances. Don’t trust the words “natural” or even “organic!” Shop natural baby and children’s products here. Soap isn’t the only toxic chemical your kiddo might encounter as he scrub-a-dub-dubs. Most cities add chlorine and/or chloramine (the result of combing chlorine and ammonia) to their water sources in order to sanitize it and make it safe for consumption. But is chlorinated water truly safe? Chlorine may kill germs that would otherwise make us sick, but it also kills off the good bacteria that should be inhabiting our skin, eyes, sinuses, mouths, & guts. Not only does it affect your child’s microbiome, but long-term exposure to chlorinated water also puts your child at risk for cancer, asthma, eye, skin, & throat irritation, liver & kidney dysfunction, and fertility problems. What you can do: install filters on your shower like this and on your bath spout like this. You can also invest in a whole house filtration system like this. Thought to protect children’s teeth from cavities, fluoride is added to the water of most cities as well. Read more about the dangers of fluoride here. What you can do: provide your child with filtered water to drink. Or, my personal favorite (because it leaves the minerals in your water), purchase a Berkey water filter (with additional fluoride & arsenic filters). This is the one our family has. Guess what? It’s not just the chlorine and fluoride you have to worry about in your child’s water! Heavy metals like mercury, cadmium, arsenic, chromium, thallium, and lead have all been found in municipal water sources. Effects of heavy metal exposure include reduced growth and development, cancer, organ damage, nervous system damage, and in extreme cases, death. Exposure to some metals, such as mercury and lead, may also cause autoimmune disease. What to do about it: see above water filtration suggestions. 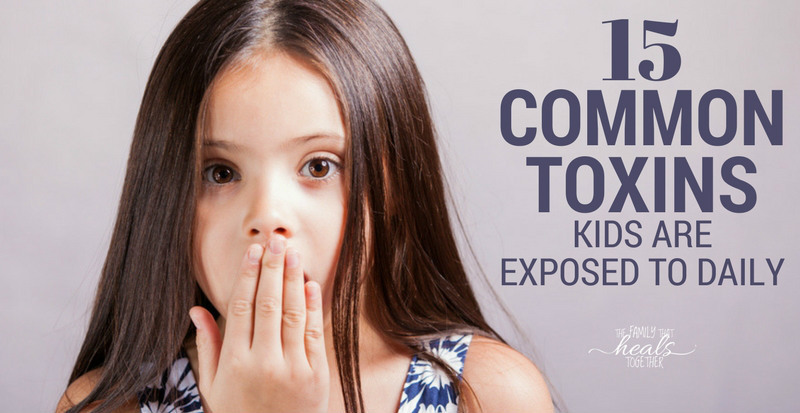 While your child scrubs away on those pearly whites, he may be introducing toxic chemicals into his mouth. Not only do most toothpastes contain fluoride (see above), but many of them contain sulfates, artificial sweeteners, and even food dyes. Ain’t nobody need that junk. What do to about it: first of all, it doesn’t matter how much a child brushes his teeth if he eats a junky diet. Be sure your kiddo is eating a nutrient-dense diet full of veggies, raw milk, grassfed butter, extra virgin cod liver oil, animal fats and proteins, and very little sugar, grains, and processed foods. To get a good clean without the nasty additives, try my homemade tooth powder recipe or, my kids’ favorite lemon-flavored tooth paste. Stop! Before you spray that cleaner, step away from the spray bottle. Most of today’s popular cleaning supplies contain a concoction of artificial fragrances, ammonia, bleach, and other toxic chemicals. These chemicals can affect your child’s development, contribute to asthma and allergies, irritate your child’s skin, eyes, and lungs, and cause fertility problems. What you can do: try making your own easy all-purpose cleaning solution with water, liquid castile soap, and essential oils. I use about a tablespoon of soap, 24 drops of essential oils, and fill my spray bottle the rest of the way with water. It smells nice and disinfects- win win! Also see: how to make your own homemade window cleaner! We have a problem here in America. We have food. And then we have “kid food.” Frankly, I think it’s ridiculous. Common kid foods contain everything from msg, to food dyes, to artificial sweeteners, all of which are known neurotoxins that prevent proper brain development and can contribute to behavioral and developmental disorders. Click here for a list of foods you should avoid NOW to help your child. What you can do: read labels. Avoid ingredients you don’t recognize and, better yet, avoid packaged foods. Instead, feed your child nutrient-dense foods like veggies, raw milk and butter, animals fats and proteins, eggs, and very little sugar and grains. 10. Juice & pasteurized milk. Nothing tops off a bowl of colorful cereal like a helping of grocery store milk. Devoid of nutrition and difficult for little tummies to digest, pasteurized milk does not deserve a spot on your child’s breakfast table. Read my thoughts on how to choose healthy dairy products here. In addition, many children’s breakfast plates are accompanied by a side of juice. Recent recommendations from American Academy of Pediatrics suggests avoiding fruit juices in younger children. Not only do these juices offer little to no nutrition, but they can lead to gut abnormalities due to malabsorption of indigestible sugars. What you can do: make sure your child’s beverage is just a nutritious as his breakfast. Serve up a glass of raw milk, a smoothie, a fresh-pressed veggie juice, my kids’ favorite, bulletproof chocolate milk, or a plain ol’ glass of filtered water. Take a look around your home and you’ll likely find a variety of plastics. From furniture to toys to food storage, plastic abounds in most homes. The problem with this is that plastic is made from toxic chemicals that, you guessed it, disrupt your child’s hormones, leading to problems with puberty and fertility. Many plastics now boast a “BPA-free” label, but don’t be so quick to think this is a good thing. While BPA has been shown to disrupt hormones, making it especially toxic to pregnant women, fetuses, and young children, its replacement, BPS, is equally harmful. What you can do: avoid plastic, when possible. Opt for wooden toys, and, most importantly, glass or wooden dishes, stainless steel cups (great for accident-prone kids! We love and use these. ), and glass food storage containers (plastic lids don’t touch food; never heat with lids on!). Like mattresses, furniture must pass flame resistance tests. Of course, manufactures use the cheapest means possible to accomplish this, resulting in most furniture being coated with endocrine-disrupting flame retardants. These chemicals contribute to everything from diabetes, to cancer, to asthma and more, and have no place in the home of growing children. What you can do: buy second-hand furniture that has already off-gassed much of the toxic chemicals they’re sprayed with OR search for companies who use other means of accomplishing flame resistance, like Ikea. 13. The air they breathe. It’s a given that outdoor air is host to any number of toxic chemicals, from car to fumes, to factory waste, as well as pesticides and herbicides sprayed on industrial farms and your neighbor’s lawn. BUT- did you know the air inside your home can also be toxic? As noted above, cleaning and laundry supplies can taint the air inside your home, as can candles and other fragrances. Other chemicals disrupting the air quality in your home include flame retardants, paints, adhesives, and even the materials the home is made from. See suggestions above for suggestions for laundry and cleaning supplies. Use an essential oil diffuser to make your home smell nice and clean the air. Fill your home with fresh plants, which help to clean the air. Read about the best houseplants to purify indoor air here. 14. Antibiotics and other pharmaceuticals. Due to everything from ear infections to strep throat, antibiotic usage is rampant in childhood. But it doesn’t have to (and shouldn’t!) be that way. Antibiotics and other pharmaceuticals destroy good gut bacteria, leading to chronic disease, allergies, and impaired immune function. It’s always best to avoid antibiotics and other unnecessary medications when possible. What you can do: If your child is sick, try natural remedies before rushing to the doctor. Many herbs have antibacterial properties, and can be very effective against infection. Try this natural antibiotic extract or this natural ear infection remedy. Our family’s favorites include oregano spirits (which has proven effective against strep & scarlet fever), elderberry syrup (good for colds), and Happy (a supplement which targets unwanted organisms in the gut, and has proven to end stubborn stomach bugs in our house). For the same reason that antibiotics should be used with caution, so should antibacterial products. Not only do many antibacterial sprays and gels contain hormone-disrupting ingredients, they wipe out your kid’s microbiome. Additionally, research is emerging that shows children raised in a sterile environment are more likely to suffer from chronic disease and obesity because their immune systems do not encounter germs frequently enough to stay strong. What to do: let them get dirty! Playing in the dirt is GOOD for your child’s immune system. Use regular, natural soaps as needed. Protect your kids from toxic chemicals! If this list is making your head spin, just take a breath! Rome wasn’t built in a day, and you won’t be able to remove every toxic chemical from your home overnight. Instead, focus on what you can control: switch the easiest stuff first, like cleaning supplies, then processed foods; make the switch to cleaner air, water, and, finally, safer furniture and mattresses as you can afford it. Protecting your child doesn’t have to be scary or stressful. Just adopt a can-do attitude, then do what you CAN DO! Tell us how you protect your kids from these toxic chemicals, then be sure to share this post using one of our links so friends can read up on how to protect their kids too!